Christopher Matthew’s latest collection of canny comic verse negotiates the perils and pitfalls of romance in later years. Love is revealed in the most unlikely places, with the most improbable people seeking it. 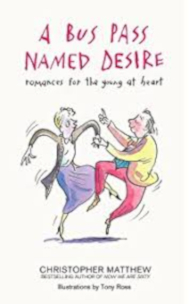 Whether in Dorking, Diss, Clapham Junction or West Wittering, there are amorous opportunities waiting to be seized at the bridge table, on the tennis court, in the herbaceous border, on a bicycle made for two, or simply in warm companionship. Often hilarious and always touching, these delightful and stirring tales of late-flowering love (and even mild debauchery in a retirement home) are a celebration of life for the young at heart. And never again will you take the 49 bus without a sideways glance at the driver. First published by Little Brown (Hachette, UK) in 2016.